Name was registered in August of 1979 (? ), A.S. XIV. Blazon: Or, on a fess azure between three roses gules a boar's head erased Or, orbed and langued gules. Arms was registered in August of 1979 (? ), A.S. XIV. Blazon: Per chevron azure and argent goutty de sang, in chief a Latin cross argent. Device was registered in August of 1997, A.S. XXXII. Blazon: Argent, a sea-horse erect and sinister facing, maintaining a trident, gules between two flaunches azure, each charged with a rose argent, barbed and seeded proper. Arms was registered in June of 1989, A.S. XXIV. Blazon: Azure, a dragon passant and a bordure engrailed Or. Arms was registered in March of 2005, A.S. XXXIX. Blazon: Azure, two swords in saltire, overall a dragon passant contourny argent. Badge was registered in March of 2005, A.S. XXXIX. Name was registered in April of 2009, A.S. XLIII. 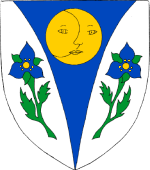 Blazon: Argent, on a pile ployé throughout azure between two trilliums inverted azure seeded Or slipped and leaved vert, a moon in her plenitude Or. Arms was registered in April of 2009, A.S. XLIII. Name was registered in August of 1990, A.S. XXV. Blazon: Argent, a bend sinister vert between a pithon displayed and a natural dolphin naiant to sinister sable. Arms was registered in August of 1990, A.S. XXV. Blazon: Per chevron inverted sable and gules, overall a winged serpent erect displayed argent. Arms was registered in March of 1991, A.S. XXV. Name was registered in January of 1994, A.S. XXVIII. Also known as: Riona Jullian MacAlistair, Jillian McAllister, Courtney of Vatavia. Blazon: Argent, on a fess between three martlets vert an elephant statant argent a bordure vert estencely argent. Arms was registered in August of 1997, A.S. XXXII. Blazon: Argent, three demi-lightning bolts conjoined in pall inverted throughout azure between a sword, a sword inverted, and a feather sable. Arms was registered in August of 2008, A.S. XLIII. Name was registered in May of 1991, A.S. XXVI . Blazon: Purpure, three delfs voided interlaced in bend sinister argent. Device was registered in May of 1991, A.S. XXVI. Name was registered in September of 1989, A.S. XXIV. Also known as: Zevak of the Woodlands. Blazon: Per fess gules and vair, in saltire two scimitars proper, in chief an anvil Or. Arms was registered in November of 1988, A.S. XXIII. Name was registered in April of 2012, A.S. XLVI. Blazon: Per pale Or and gules, a lion contourny counterchanged, a chief dovetailed counter-ermine. Arms was registered in April of 2012, A.S. XLVI. Name was registered in January of 2003, A.S. XXXVII. Blazon: Or, a bend counter-ermine between a bow nocked with an arrow and a lion rampant gules. Arms was registered in January of 2003, A.S. XXXVII. Name was registered in June of 2014, A.S. IL. Blazon: Argent, on a chevron purpure three dragonflies palewise Or. Device was registered in July of 2014, A.S. IL. Name was registered in January of 1985, A.S. XIX. Blazon: Per chevron rayonny sable and gules, a sledge-hammer palewise within a bordure Or. Arms was registered in January of 1985, A.S. XIX.